Order brochures online. 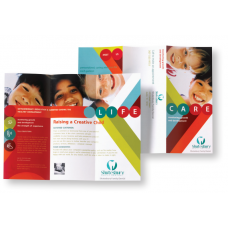 If you are looking for brochure printing in St. John's, Halifax or anywhere else in Atlantic Canada, you found it! At Ace Printing we offer the ease of online ordering as well as free Canada-wide shipping. Just upload your documents, select your quantity and we will take care of the rest. If you have any questions or customization please contact us for fast friendly service. Custom Half-fold brochure. Full color printing on front and back, folded to 5 1/2 " x 8 1/2". C.. Custom Tri-fold brochure. Full color printing on front and back, folded to 3 2/3" x 8 1/2". Customer..